This document describes the GDX (GAMS Data eXchange) facilities available in GAMS. The GDX facilities provide basic functionalities for exchanging GAMS data such as read and write. In addition to these facilities, there are a number of GDX Tools for exchanging data between GAMS and othere data sources as well as for performing specific operations on a GDX file. A GDX file is a file that stores the values of one or more GAMS symbols such as sets, parameters variables and equations. GDX files can be used to prepare data for a GAMS model, present results of a GAMS model, store results of the same model using different parameters etc. A GDX file does not store a model formulation or executable statements. Among other usages a GDX file can also be used to prepare data for a GAMS model, pass results of a GAMS model into different programs, and pass results into GAMS from different programs. GDX files are binary files that are portable between different platforms. They are written using the byte ordering native to the hardware platform they are created on, but can be read on a platform using a different byte ordering. See also General notes on GDX files . Reading a GDX file into a GAMS model can be done during the compile phase or the execution phase. See Example 1 - Reading a GDX File and Example 2 - Reading a GDX File on how to use $gdxin. the preceding $gdxin specifies the GDX file name and opens the file. the succeeding $gdxin closes the GDX file. id1<gdxid1 id2<gdxid2.dim3 Reads GAMS one dimensional set id1 and id2 from the GDX parameter or set gdxid1 and gdxid2. WIthout the dimN suffix, GAMS tries to match the domains from the right (<). If no domain information is available for the GDX symbol, the dimN suffix determines the index position that should be read into the GAMS set. For more details see the Example 4 - Reading a GDX File. id1<=gdxid1 id2<=gdxid2.dim3 Reads GAMS one dimensional set id1 and id2 from the GDX parameter or set gdxid1 and gdxid2. WIthout the dimN suffix, GAMS tries to match the domains from the left (<=). If no domain information is available for the GDX symbol, the dimN suffix determines the index position that should be read into the GAMS set. For more details see the Example 4 - Reading a GDX File. Loading the level values for a variable into the same variable (x=x.l) works but loads everything including bounds, scales, marginals and levels. See Example 1 - Reading a GDX File and Example 2 - Reading a GDX File on how to use $load. The $loaddc command lists all symbols in the GDX file and will cause a compilation error when the data read causes a domain violation. In contrast the $load command simply ignores elements that are not in the domain. See also Compile Phase Reading Data using $load. See Example 4 - Reading a GDX File on how to use $loaddc. The $loadm, $loadr, $loaddcm, and $loaddcr are additional forms of the $load and $loaddc directives. The M indicates a merge and the R indicates a full replacement. id1<gdxid1 id2<gdxid2.dim3 Reads GAMS one dimensional set id1 and id2 from the GDX parameter or set gdxid1 and gdxid2. 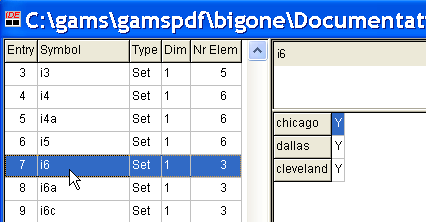 WIthout the dimN suffix, GAMS tries to match the domains from the right (<). If no domain information is available for the GDX symbol, the dimN suffix determines the index position that should be read into the GAMS set. id1<=gdxid1 id2<=gdxid2.dim3 Reads GAMS one dimensional set id1 and id2 from the GDX parameter or set gdxid1 and gdxid2. WIthout the dimN suffix, GAMS tries to match the domains from the left (<=). If no domain information is available for the GDX symbol, the dimN suffix determines the index position that should be read into the GAMS set. See Example 4 - Reading a GDX File and [load8] examples on how to use $loadm and $loaddcm. The command $loadidx read GAMS symbols from the GDX file. Each symbol should have been written using an indexed write. See [ldidx01] example on how to use $loadidx. The execute_load statement acts like an assignment statement, except that it does not merge the data read with the current data; it is a full replacement. The same restrictions apply as in an assignment statement: we cannot assign to a set that is used as a domain, or to a set used as a loop control. Sets defining domains cannot be loaded. However sets that are subsets of existing sets and do not define new elements can be loaded at execution time (Domain defining sets can be loaded can at compile time using $load). setid=* Allow to load the universe of labels from a GDX file into a set. Note, that only labels known to the GAMS program will be loaded. items must be declared with Set, Parameter, Scalar, Variable or Equation statements before the execute_load appears. when loading data domain checking is not enforced so that when an item is resident in a GDX file for set elements not present in the current file these items are ignored and do not create errors or cause generation of any messages. The execute_loaddc variant checks to see that the domains match. See [load11] and [qp1x] from on how to use execute_load. With execute_loaddc statement any domain violation will be reported and flagged as execution error. In contrast, the execute_load statement ignores all domain violations and loads only data that meets the domain restrictions. In addition to loading data for sets, parameters and variables, we can load a field of a variable into a parameter. Warning: when loading a single field, all other fields are reset to their default value. See [load7] example on how to use execute_loaddc. The execute_loadpoint is similar to execute_load, however, the new values are merged with the old values. If no arguments besides the name of the GDX file are given, all variables and equations that match variables and equations of the calling GAMS programs will be merged with the GDX level and marginal values. Bounds, scales and priorities will remain unchanged. 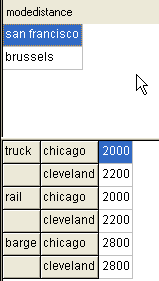 The file trnsport.gms (from [TRNSPORT]) has been modified to use the demand data from an external source. Only the relevant declarations are shown. The parameter B is read from the GDX file using the name 'demand', and only those elements that are in the domain 'jwill be used. Values for parameterBthat are outside the domainj` will be ignored without generating any error messages. In this example, the set J is also read from the GDX file, and is used as the domain for parameter B. All elements read for the set J will be used. Values for the parameter B that are outside the domain J will be ignored. Note that the dimension of set J is set to one by specifying its domain. which lists the items present by Type, Name, Number of sets the item is defined over(Dim), number of elements in the file for this item (Count). The following code loads the entire node set n of the network as well as the nodes with outgoing (out) and incoming (in) arcs and the capacity c.
where k be renamed from j, abe renamed fromsup, andbbe renamed from demin the GDX filetran2.gdx`. and the job is aborted with an execution error. domain errors occur whenever set element names are not spelled exactly the same as an element specified in the corresponding set in GAMS flagging alternative spellings or missing elements. In addition to reading data from a GDX file during compile phase or execution phase there are a few ways to examine the contents of a GDX file. The $load commad without any parameters will show a listing of all symbols in the GDX file. See Example 3 - Reading a GDX File on how to use $load to get a listing of all symbols. The GAMSIDE can be used to view the contents of a GDX file by opening a GDX file with the Open file dialogue. The IDE only recognizes the .gdx file extension of a GDX file. The resultant display gives the names of the items in the GDX file on left hand part of the screen while the right part gives the exact data entries for the item highlighted in the left hand part. the columns are sortable in the left hand portion of the display. All one needs to do is to click on the gray boxes (Symbol, Type,...) with the mouse. There is also a search dialog at the bottom that permits one to look for select items. a right mouse click allows one to write the contents of any or all items to HTML format. The GDXDUMP utility can list the symbols in the file and it also can write sets and parameters formatted as a GAMS data statement. the gdxfile_name is the name of the GDX file to write data from. 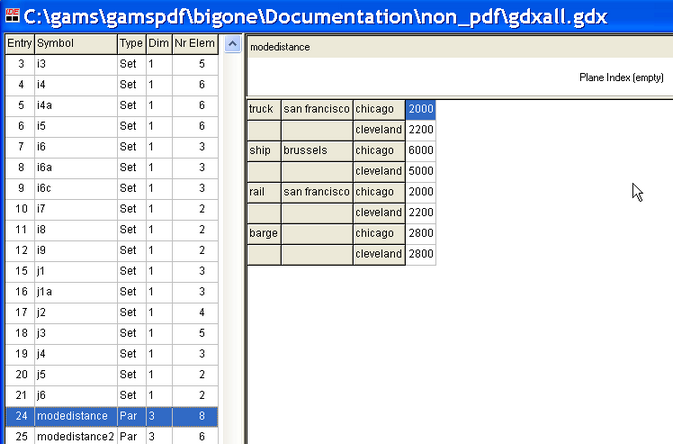 Data on solution items (variables and equations) formatted in a fashion suitable for import as a basis in another GAMS program where the marginals and levels are output. All of the scalars, sets and parameters (tables) in a GDX file to standard output formatted as a GAMS program with data statements or in CSV format. It skips information for variables and equations. Under the format=CSV choice it only creates output when a symbol is selected using the SYMB syntax. Under the format=CSV choice when the requested symbol is a variable or an equation one only gets the level values not the marginal, under the other formats one gets all items. Under the format=gamsbas choice one gets all variables and equations when the SYMB syntax is not used. See more Examples on inspecting contents with GDXDUMP. The GDXDIFF utility can be used to compare two GDX files by creating a third GDX file containing a list of differences between all symbols. In particular for all items with the same name, type and dimension in the two GDX files the differences in numerical values are written to a third GDX file with A summary report written to standard output (ordinarily the LOG file). This utility can be used either at command line, or by $Call, or execute command. Diffile An optional third file name that is the name of the GDX file that contains the differences found in the parameters. If that parameter, is absent the file will be named 'diffile.gdx' and placed in the current directory. RelEps = value A tolerance that is the maximum percentage amount that two numbers may differ by ie given a1 and a2 then abs(a1-a2)/max(abs(a1),abs(a2)) is reported as different if it exceeds this tolerance. ID=Identifier Limits the comparisons to selected items; items not specified will be ignored. Multiple items can be specified as: ID=id1 ID=id2 or ID="id1 id2"
which reports on the differences found in the two files. dif1 indicates that the entry occurs in both files and shows the value found in the first file. 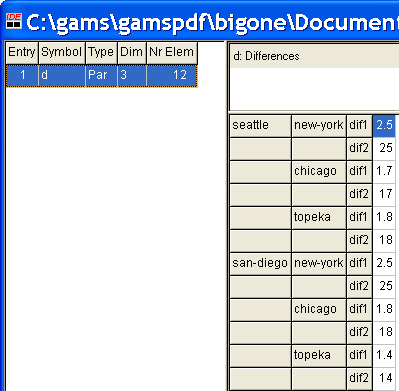 dif2 indicates that the entry occurs in both files and shows the value found in the second file. ins1 indicates that the entry only occurs in the first files and shows the value found. 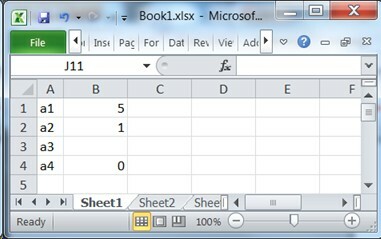 ins2 indicates that the entry only occurs in the second file and shows the value found. See more Examples on inspecting contents with GDXDIFF. Writing of GDX files in a GAMS model can be done during the compile phase or the execution phase. A GDX file can also be written after compilation and execution. See Example 1 - Writing a GDX file and [CompTimeWriteTrnsportGDX] for examples on how to use $gdxout. the preceding $gdxout specifies the GDX file name and opens the file. the succeeding $gdxout closes the GDX file. See Example 1 - Writing a GDX file and [unload1] - [unload9] for examples on how to use $unload. See also [CompTimeWriteTrnsportGDX] example. The execute_unload statement replaces an existing file with that name; it does not add symbols to or replace symbols in an existing GDX file. Without specifying any identifier, all sets, parameters, variables and equations will be written to the GDX file. The execute_unloaddi statement replaces an existing file with that name; it does not add symbols to or replace symbols in an existing GDX file similar to execute_unload, but also writes the domains of all unloaded symbols to the same file. The execute_unloadidx statement requires that each symbol written is a parameter; each parameter must have a domain specified for each index position. These domains have the requirement that they are formed using an integer sequence for the UELs that starts at 1 (one). The domain names are changed to indicate the size of each domain. This information is used when reading the data back from the GDX file using $LoadIDX during compilation. Using the special domain names, the UELs for the domains can be recovered without writing the domains to the GDX file; see example below. when only file_name is specified without other parameters all GAMS Symbols will be written into the GDX file file_name. The GAMS option gdxUELs controls which UELs are registered in file_name. With option gdxUELs = squeezed; (default) only the UELs that are required by the exported symbols are registered while all known UELs are registered if we set option gdxUELs = full;. See also [unload10]. See Example 2 - Writing a GDX file and [qp1x] on how to use execute_unload. See [unload10] on how to use execute_unloaddi. See Example 3 - Writing a GDX file on how to use execute_unloadidx. A GDX file containing the marginals and levels for all variables and equations at the end of a solve will be created with the command line parameter, model attribute or option statement Savepoint. One can save the solution information from the last solve or from every solve. The points that are saved can be used to provide an advanced basis, integer program starting point or NLP starting point. when number equals 1 a point gdx file is saved from the last solve in the GAMS model and the file name will be modelname_p.gdx where model name is the name of the model identified in the solve statement. when number equals 2 a point gdx file is saved from the every solve in the GAMS model and the file name will be modelname_pnn.gdx where model name is the name of the model identified in the solve statement and nn is the internal number of the solve. Thus if 10 solves occur one will get 10 files named modelname_p1.gdx through modelname_p10.gdx. saved a point gdx file firm_p.gdx. saved two point gdx files transport_p1.gdx and transport_p2.gdx. the GDX point file contains numerical records for all variables and equations giving just their levels and marginals. In a non point GDX file information on bounds and scales are also present, if defined. This example has modified the file trnsport.gms from [TRNSPORT] by adding the following statements after the last line. This example creates the GDX file tran.gdx containing the data for the sets i and j as well as the parameters d, f, a and b during the compile time, when a and b have been renamed in the GDX file to dem and sup. Also note the parameter d will not have been multiplied by 10 but rather take on their compile time value. This example has modified from the file trnsport.gms (from [TRNSPORT]) by adding the following statement right after the solve statement. After solving the model, the sets i and j and the variables z and x with all the data available after the sole. A GDX file containing all data items resident at the end of the run of a GAMS code can be created using the gdx command line option either via GAMS call at the command line or via the command line parameter box in the IDE. This will cause all sets, parameters, variables and equations to be written to the GDX file. gdxfile_name gives the file name and possible path where the GDX file is to be retained. When no path is specified the default directory is the current working directory or project directory in the IDE as seen below. will cause GAMS to write the gdx file trnsport.gdx. When this option is used the GDX file is created just at the end of the GAMS execution so the data written will contain the current values for all sets, parameters, variables and equations that are on hand at the end of the GAMS job. The GDX data for the variables and equations contains the levels, marginals, lower bounds, upper bounds and scales for each item. This yields a file that may be automatically opened in the IDE by doing a mouse click on the highlighted line in the IDE process window. Using the gdx command line parameter when running the model using the IDE, the process window will show the GDX file_name in blue indicating that the file can be opened using a double-click with the mouse. See also Inspecting contents with IDE. When working with GDX only one GDX file can be open at a time. When reading data from a GDX file, the symbol to be read must be declared before the reading statement appears. When the GDX file to be written has the same name as an existing GDX file the existing file will be overwritten. The resultant file will only contain the new data; there is no merge or append option. The $unload command to write a GDX during compile time using the will only write out data defined in the compilation at the point where the command appears. No results of any solves or calculations done within the current GAMS program will be reported with ` $unload. This is not true when using the execute_unload or execute_unloaddi commands. Both execute_unload and execute_unloaddi will write out data defined in the execution sequence at the point where the command appears. The results of the most recent solve command and any parameter calculations occurring before the GDX write will be reported. A command line GDX write using the gdx=file_name command line parameter will write out data defined at the end of the execution sequence. The results of the most recent solve and any parameter calculations will be reported. When loading data note that domain checking will not be enforced so that when items are resident in the GDX file for set elements not present in the current file these items will be ignored. GAMS will not generate any message to tell you items are ignored. Option Savepoint and execute_Loadpoint provide a GDX way of saving and loading a basis. GDX files as of version 22.3 are written in compressed form unless the environment variable GDXCOMPRESS is set to zero. Starting with GAMS version 22.3, gdx files can be written in a compressed format unless the environment variable GDXCOMPRESS is set to zero. A value of 1 indicates compression. Compressed GDX files are not readable by older GAMS versions but the utility gdxcopy allows one to transform to older versions. GDX files from diffent GAMS verion can possibly be incompatible due to compression among other changes. A current GAMS system can read all older GDX file formats. GDX files can be converted to a compressed format or an older format using GDXCOPY. Users can also write their own programs accessing data in a GDX file via the expert-level GDX API using gdxdclib library. The interface and usage for this library is described in a separate document; see gdxioapi.chm or gdxioapi.pdf. A number of GDX based tools and GDX related tools are included in GAMS distribution and maintained by GAMS. See also Tools Manuals. The data exchange tools provide functionality to exchange data between GAMS and other data sources. The GDX service tools operate directly on GDX containers. Some of Data transfomration tools perform very specific data transformation tasks that are either awkward or inefficient to implement in GAMS directly. Some utilities are avaiable only on specific platform. See Supported Platforms for more details.